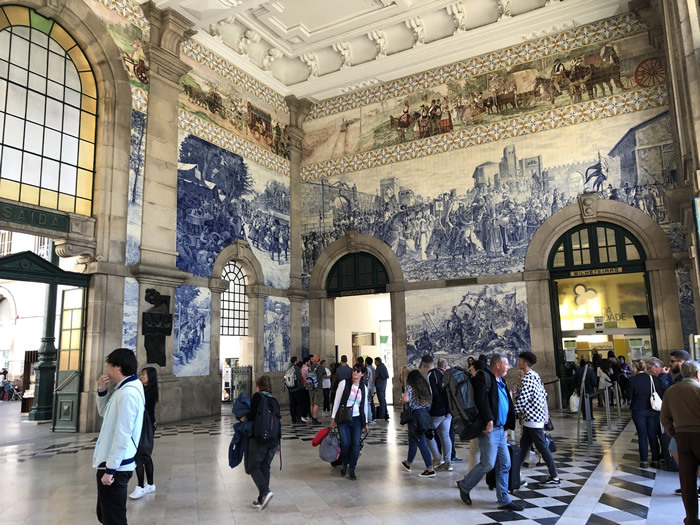 A master’s student in economics at Coimbra University taxied us to the train station for our journey to Porto. He drives a cab most mornings to make ends meet. I’d stumbled upon the perfect opportunity to ask what locals really think about the European Union’s austerity measures. Our driver explained that the Portuguese struggle particularly with high tariffs on necessary items, such as the 23% tax on electricity. The economic situation makes young people think very hard about even starting families. Portuguese long-distance trains haven’t modernized like the slick high-speeders you find in France, Spain and Italy. 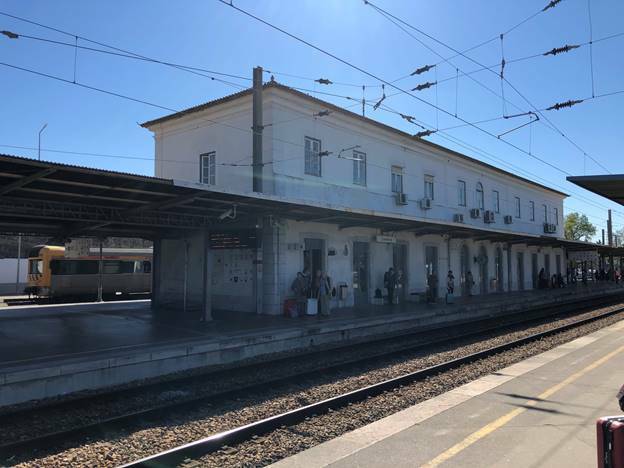 Their old locomotives lumber along sometimes-bumpy tracks, stopping at stations like Coimbra that appear to have avoided any improvements since WWI. Coimbra’s train station doesn’t have any under-or-over-passages for passengers to cross rail lines. Instead they hire full-time crossing guards and you get to drag your bags across the tracks at the guard’s discretion. Despite all this, Rail Portugal still manage to out-shine Amtrak. After all my waxing about liking larger travel accommodations, we ended up in one of our smallest rooms ever in Porto, approximately the dimensions of our bathroom cube in Coimbra. 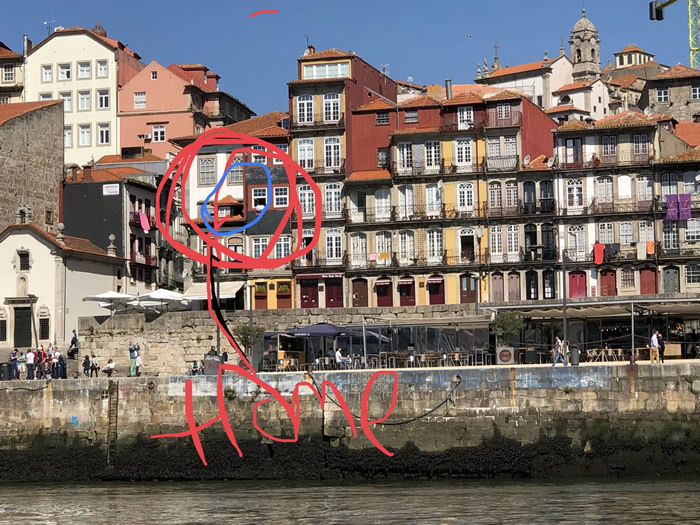 I had trouble finding something both good and spacious, so I ended up booking at a toy-sized hotel on the Douro River with just six rooms, tall and narrow like an Amsterdam house. They compensate for lack of space with great service. 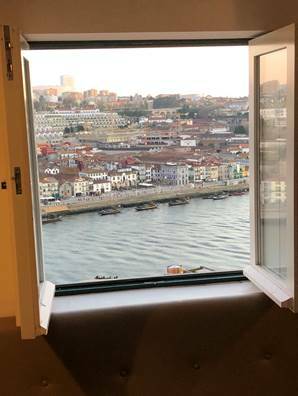 I selected a less-expensive room overlooking the street instead of the river, having read on TripAdvisor about the micro-sized view rooms. 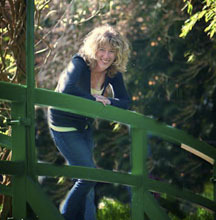 We arrived too early for check-in, but Hugo and his fiancé Louisa enthusiastically welcomed us and stored our luggage. 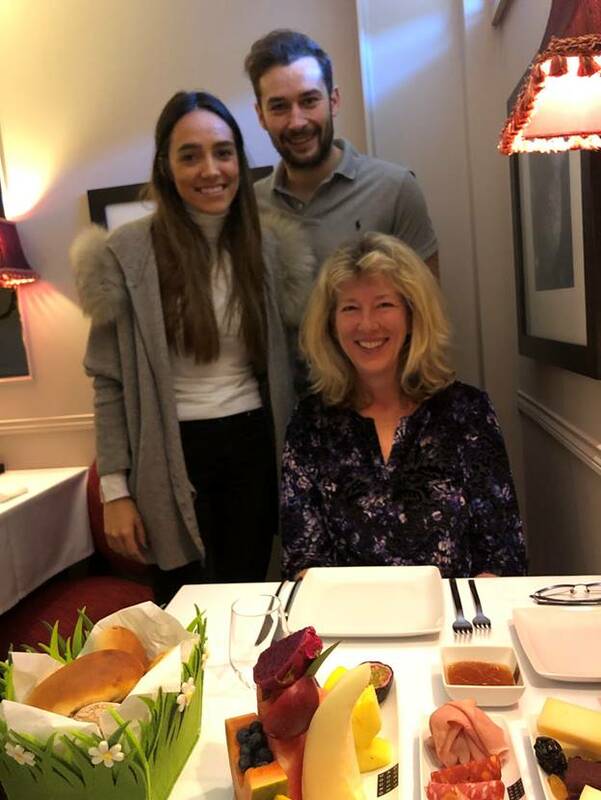 This young couple are learning the boutique hotel ropes, taking over from expert owners Carmen and João. Carmen is starting “the kids” (as she calls them) out slowly, deliberately limiting room rentals to just one couple tonight: us. We left to explore Porto for the afternoon. When we returned, the entire gang of four owners greeted us, along with George the webmaster. Oh, yay, I said, doing my best to display enthusiasm. We couldn’t tell Hugo the truth, not with his elation over sharing his happy news. Our room, just ten feet wide, could fit only my mid-sized suitcase. (The entire hotel measures just ten feet at the river end.) 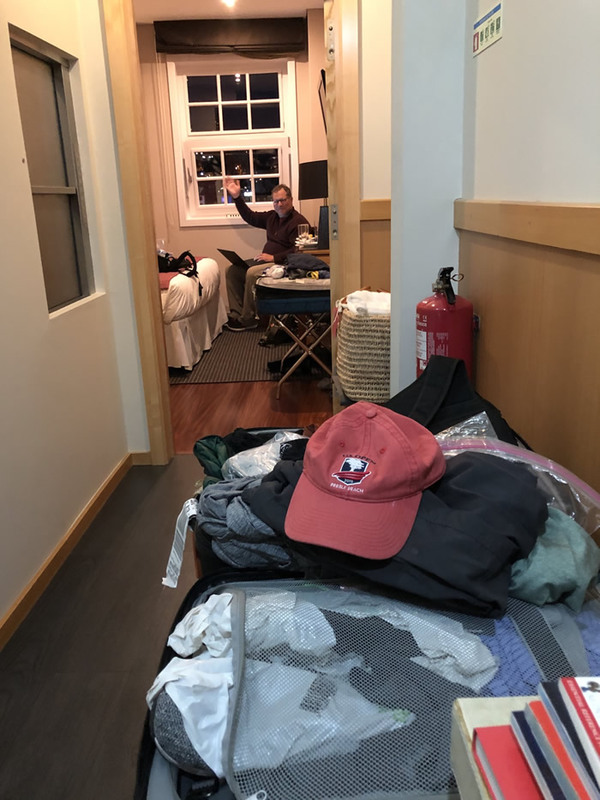 Hugo and João had placed Jim’s bag on a stand outside our room in the hall, along with our basket of hotel bathrobes and slippers. Hugo excused himself to get our complimentary port wine (for Jim) and water (cold and still) for me. A few minutes later, he returned. But before popping from the elevator down the hall, Hugo made sure to call out a warning notice for us. After all, we semi-lived in the hall. Or my hall, as Jim called it. Jim kept our door open most of the evening, saying he wanted to keep claustrophobia at bay. In the morning Jim rose before me, putzing around as much as possible in our pocket-sized room. I heard a door open and saw a flash of skin. Jim had left our room to retrieve his clothing. “Did you go out in the hall naked?” I asked. Across the river, we see riverboat cruisers docked near a colorful ferris wheel. 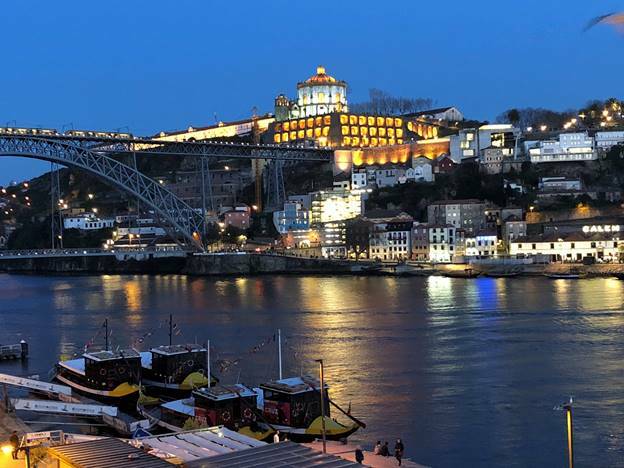 Dotting the hillside beyond, illuminated signs announce major port wine houses. To our left, a magnificent bridge soars over the wide water. I hadn’t realized how beautiful Porto is. 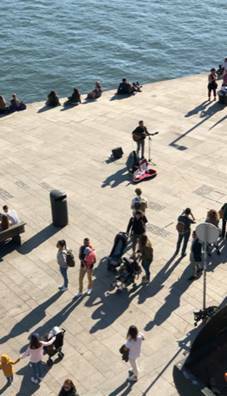 On the promenade below our room, a saxophone sings “Bésame Mucho.” Earlier an acoustic guitar strummed The Beatle’s “Blackbird.” Both musicians have more talent than the Queen tribute singer in Evora, probably a factor in maintaining their prime busking real estate on the riverfront square. I’ve eaten cod multiple times now, and I like it. We’ve not sampled all 365 ways yet, so we may have to return to Portugal in the future. Near the end of a France trip, we ordered dishes like partridge; here we consume rehydrated salted cod. Cultural acclimation. Late Friday evening, we walked past Porto’s 12th-century cathedral and noticed a large gathering of university students in the church courtyard. Many carried guitars of varying sizes, including the teardrop-shaped Fados. Beer flowed freely. I asked some students what was happening. They were having a musical competition between academic departments, one explained. Her engineering group just completed their part, and the medical students were up next. The students wore their black and white uniforms, some with the full-length capes. Instead of school colors, each department had their own colored sashes. Their capes had no fasteners, and students kept them closed with two fingers resting on their opposite shoulder. Like Dracula, Jim said. Carmen at our hotel explained that university academic groups function like our fraternities and sororities in the U.S., including occasionally getting into trouble. Hard to visualize our university Greeks back home partying on Friday nights with Fado guitars, adorned in full dress uniforms, downing beers before a 900-year old cathedral. But you never know. Our journey neared its end. Jim took off to take bridge photos. I washed my hair and grabbed a white bathrobe from the hall. My wet head wrapped in a matching towel, I stood before our view window overlooking the river promenade and watched the scene below. A Japanese tourist smiled and repeatedly waved up at me. At least I thought it was directed my way, not sure. I waved back, just in case. Japanese lady got terribly excited and her companions joined in some serious arm wagging while snapping photos of me to show their friends back home in a travel slide show. Maybe the Japanese thought they’d spotted a local, perhaps an exotic Hindu, with her hair covered in a white turban and adorned in a milky gown. I backed away from the window, thankful that unlike Jim’s earlier episode in the hall, I hadn’t been naked. I’d not been so sure about visiting Portugal--Jim’s idea. 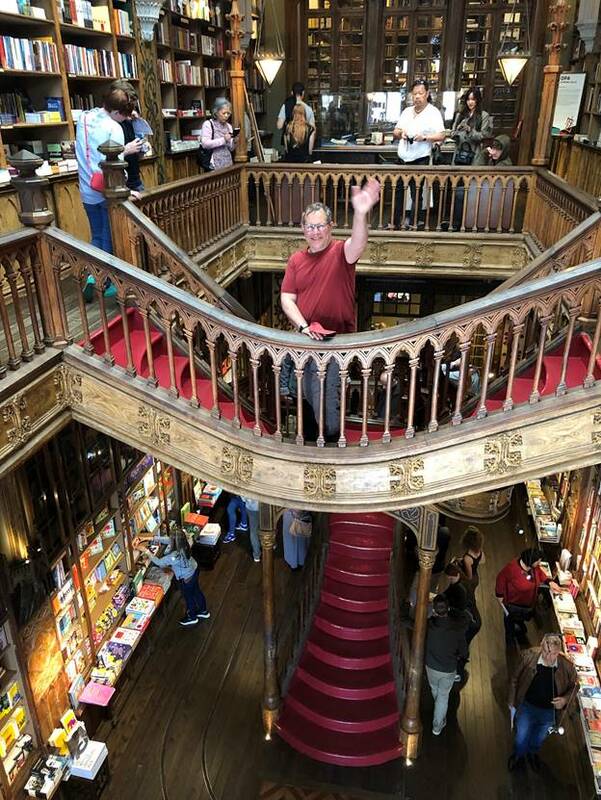 The country has few big-name sites and flows a bit behind the times, but we found it oozing with culture, kind and polite folks, and generous deals. Portugal’s a gem in the rough, probably like the Spain or Italy of 60 years ago. But unlike Spain, the middle-aged women--the standard-bearers of society--don’t yell at you. You can even walk on their grass without a scolding. They’re simply happy to see you. 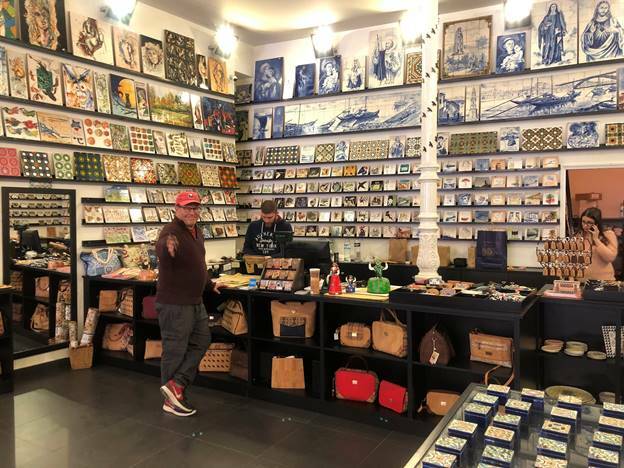 Portugal feels unspoiled by the tourist dollar, but we sense changes ahead: we can feel it brewing. I doubt it will stay this way much longer. Come to Portugal. Just don’t wait too long to do it.